Brad Sweet wheels the Ollie’s/KKR 410 winged sprint at Antioch Speedway, 2016. 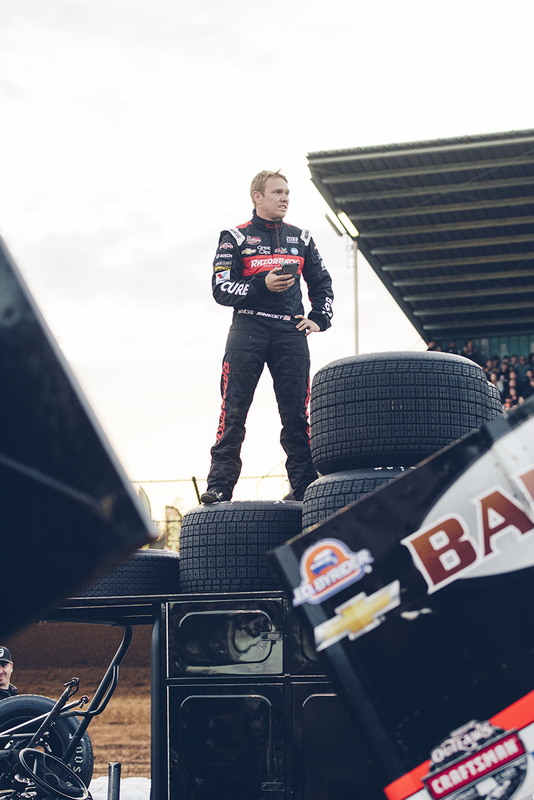 Spotlight | As the demanding 92-race World of Outlaws Winged Sprint Car Series (premier dirt track tour of U.S. and Canada) made its way to Northern California for two weekends of action at Chico and Calistoga in September 2017, Brad Sweet, 31, a series star and local hero, sat down in the backyard of his secluded Placerville home, just a few miles from where he grew up. “We just got through doing some yard work,” he says, sipping a cool beverage. “My wife, Rachel and I are expecting our first child in December, so I’m trying to get the house ready.” Sweet is currently second in series points, less than 100 markers behind eight-time champ, Donny Schatz. It’s the closest Sweet has been to the top with less than two months remaining in the 10-month-long schedule. Sweet drives for Kasey Kahne Racing with crew chief Kale Kahne, (yes, that’s Kasey’s brother). Competing at winged sprint car racing’s pinnacle, Sweet is appreciative of his success and says he’s found his home driving on the Outlaws tour. After competing in a small batch of NASCAR Nationwide and Truck series events, Sweet began driving for KKR’s open-wheel team in 2008, winning national USAC Midget events in Belleville, KS, Knoxville, IA and Eldora, OH. In 2013 Sweet continued his open-wheel campaign moving to sprint cars and winning the prestigious King’s Royal at Eldora. And, in 2014 Sweet was named Rookie of the Year in the World of Outlaws. In 2017, with over 20 wins notched on the elite tour, Sweet is at the top of his game. RUST: Your results seem to be improving each year on the Outlaws tour; things must be going well with KKR. Sweet: Kasey is a great owner. He believes in me, so that helps me get better and get more experience. It’s a great car with good people around me and you just really can’t beat that. RUST: And, you are getting closer to beating Donny Schatz in the championship standings; that’s got to feel good. Sweet: Yeah, I think our consistency and speed has been really good this year. We’re lacking a little in the win department so, that’s frustrating but that’s just racing sometimes. We’ve lost quite a few heartbreakers this year and that’s frustrating but it’s hard to look at your season and look at all the second and thirds and feel too bad. RUST: What makes Donny so hard to beat? He’s just a one of a kind driver. He’s been doing it forever. He’s got a good crew chief (Rick Warner) and understands the long, grueling season. He keeps himself happy and does a nice job. He’s hard to gain points on. During the later part in the season it gets harder to gain points. So, 90 is going to be tough to overcome but like you said, we have to hold our heads high because we’re getting closer every year. And this year we’re the closest to him that anybody has probably been to him in quite a few years. You know, since Daryn (Pittman, KKR teammate) beat him in 2013. No, I’m not saying we can’t beat him, I’m just saying we’ll be happy either way and we’ve been able to stick with him. RUST: Tell me how you got started in racing. Brad Sweet: I started going to the races around here when I was little and my dad was on the crew for a local guy named Tim Richardson. We were just always around it. We went and watched the outlaw karts at Cycleland (Speedway) when I was probably six or seven and I don’t think my dad had a chance from that point on. I wanted to be in one and once I got in one, I never wanted to get out of one. I always did really well and that obviously helped the family; we didn’t tear up a lot of stuff. We raced at Cycleland and did that until I was about 14 and tried to move up to mini sprints but at that time you had to be 16 to race just about anything. So, we sat out a little until I got in a 1200cc mini sprint and I did that for a year. I got an opportunity to drive a sprint car when I was about 17 and I’ve been racing sprint cars ever since. RUST: Where did you race? Sweet: I started racing sprint cars around here at Chico, Placerville and Marysville. That was our home base of tracks. Sweet picks up victory number five of 2017 at Calistoga Speedway. RUST: At what point did you leave California to try racing in Indiana? Sweet: I graduated high school and when I was 19, I was home for a little bit and then told my mom and dad that I would like to try it (moving to Indiana) and see if I could make the racing thing work. The only place that I thought would work was Indiana. You can’t sit around and race in California—you get stuck. At that point, that was how I looked at it. I had been driving for somebody else, so, I’d been saving up and I built one sprint car, had one engine, and a limited amount of stuff. So, one buddy, named Darren Smith, and me drove to Indiana and raced for a whole summer in 2005. I also drove for other car owners, drove my car and kinda made a little bit of a name for ourselves. There was a lot of crashing, a lot of learning, but really wouldn’t have it any other way. At that point there were a lot of car owners that were looking for drivers. So, I drove for about six or seven different car owners, one-off race, or another guy for a month. It was a lot of experience and that’s basically how I got my name out there during that first year. I took a chance to see what would happen. It was either that or get a job around here and race locally. And, you know, I didn’t have much to lose. I didn’t have any bills, nothing tying me down. So, it was definitely worth trying. RUST: That was a big step and must’ve been a great learning experience. Sweet: That was the biggest thing for me. It was such a learning experience. It made me appreciate everything because of how hard it was to do it. I bought the truck for $500 with a little rinky-dink trailer. It was hard. I didn’t have mom and dad pumping money into my pockets and pay for everything. If I wrecked a car, I begged, borrowed and stealed to do whatever we had to do to get to the next race. At that time in Indiana, the tracks paid cash at the end of the night and we’d race two to three nights a week and whatever cash we’d make, that would be the money we’d use to get us through the week and back to the race the next week. We lived all over the place but we were in Brownsburg, Indiana, mostly, just outside of Indianapolis. Going for the win, Sweet (49) holds off Donny Schatz (15) during the 2017 Outlaws feature at Stockton. 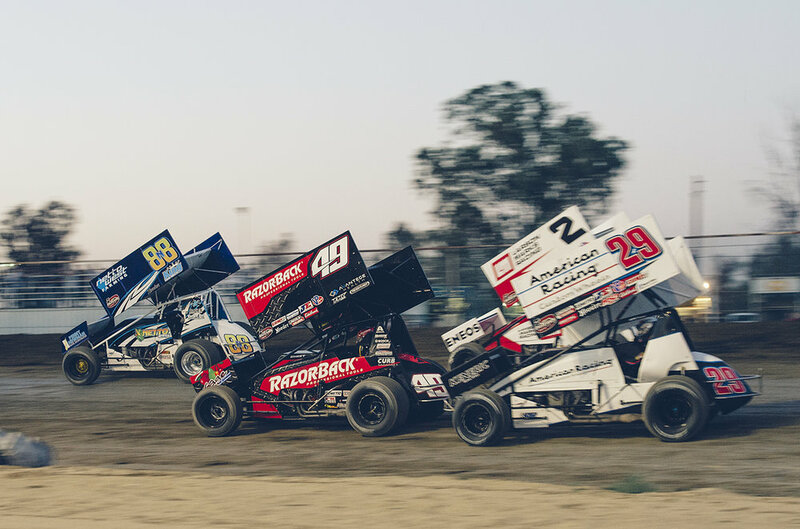 Heat race restart at Kings Speedway, Hanford, CA. Sweet makes a qualifying lap at Tulare, 2017. RUST: So, when did the first break come along? When did you start racing with some of the established USAC teams? Sweet: In 2006, Jack Yeley, J.J. Yeley’s father, had a non-wing sprint car around Indiana that I drove for a year and I also would come back to California to race winged sprints. I wouldn’t call it a big break, but it was a little more of a steady deal. I didn’t drive the family car anymore so; none of the bills were on me. I just paid rent in Indiana but I was getting kind of tired of it. I didn’t have the big break that I was hoping for and I was getting kind of homesick. In 2007 I came home to California to drive for a guy who was starting a team named Gary Perkins. Around the middle part of that year I got a call from Keith Kunz in Indiana, and he wanted me drive his midget. I would call that my first real, big break. Keith’s a really smart guy and he’s kind of a legend and he’s made a lot of names in the sport. That’s what opened the door for Kasey Kahne Racing, they were looking for a driver and I was starting to do really good in everything that I was doing. I was not wrecking and I was contending for USAC midget wins. And I would come out to California for the World of Outlaws and run top three. Things were going pretty good and there weren’t a lot of other drivers that were sticking out at that point. So, honestly, that was my big break. Once I got with them (KKR) the rest has been history. I’ve been with KKR for 10 years now. From that point on, I could just focus on racing and making a pretty good living. It shifted from the USAC side to a little bit of stock car stuff and back to the World of Outlaws. And this is where I really found my home—with the Outlaws. RUST: Do you have a favorite part of the U.S. that you travel through while you’re on the tour? Sweet: I like coming back to California. I like the West Coast; I feel a lot more at home. I love going through Washington and Oregon. We just raced in Montana and South Dakota; it’s just really pretty. Wyoming, I like it out there. I’m kind of a country kid at heart. I grew up out in the country; I don’t love cities. The East Coast has never been my favorite place, not that I don’t like it. I like the Charlotte area. I don’t love Pennsylvania, I don’t love New York but I’m a well-versed traveler. I’ve been to Australia, Canada. Sweet at Placerville, keeping an eye on the competition. RUST: When you’re in California, do you have a track that you look forward to racing? Sweet: California has some good tracks. I like going to Tulare (Thunderbowl Raceway); I’ve always enjoyed racing there. And, of course, I like going to Placerville. I only live like seven minutes from the racetrack. It’s a cool track. RUST: You won Trophy Cup at Tulare in 2008. Sweet: Yep, I’ve been in contention for Trophy Cup quite a few times. RUST: Right, you almost won it again in 2013 in a battle with Kyle Larson that is now somewhat legendary. How do remember that night? RUST: What are your favorite tracks outside of California? Sweet: Knoxville Raceway in Iowa; it’s the most technical track and it has the biggest race (Knoxville Nationals). I love going there. I love going to Eldora in Ohio (Kings Royal). I’m not sure if I love the racetracks so much because they have the biggest races, or I just really like the racetracks; probably a little bit of both. I love the fact that those types of tracks are so professionally run and they have races that pay big money to win. It just makes everything nice when you have all of those things put together. I won the Kings Royal and that was a big deal—with $50,000 to win. I liked putting my name on that trophy. RUST: How hectic is it for you during some of the busiest parts of the Outlaws schedule? Sometimes you’re racing four to five nights a week in different parts of the U.S.
Sweet: Yeah, it changes week to week, depending on where we are. I did a lot of traveling with the guys this year in the truck and trailer. I was saving money for my house so, I stayed in the hotels with them; shared a room with the crew chief. A lot of times they’re working on the car in the parking lot. Sometimes there’s good food around; sometimes there’s a mall around. If I’m sitting around, I like to find a gym to get a work out. Doing laundry, get my driving suits washed, pitch in with the guys. It just kind of depends. Two years ago my wife Rachel and I had a motorhome and a t-shirt trailer and we’d drive the merchandise trailer and sell. RUST: You are the promoter for the annual World of Outlaws race at Placerville in March, how did you get started doing that? Sweet: Next year will be the fourth season, yeah. Well, I have a lot of experience in the racing industry and I do think about a lot of different things in racing—like how to make money besides just driving a car. You kinda gotta stay proactive. So, basically, I was thinking, I’d like to promote a race at some point. It’s kinda my hometown. So, I just went and asked the guy (Placerville Speedway promoter) one day and he said he didn’t want to take the risk on having a World of Outlaws event. He said, if you want to do it, you could do it. And the Outlaws were willing to try it and everything just went together. Obviously, I was really nervous the first year but so far it’s been amazing and turned out really good. RUST: When you’re back home in Placerville, what are some things that you like to do? Sweet: Honestly, when I get off the road I like spending it with family and having cookouts and just get caught up with my wife. I’d like to go the lake more and there are some rivers around here that I wish I could fish in more often. I don’t know. We like to go to Old Town Placerville and have a beer and just hang out, too.